The International Shipping Federation (ISF) and the International Chamber of Shipping does a great deal of admirable work for seafarers. On their website you will find a multitude of resources. 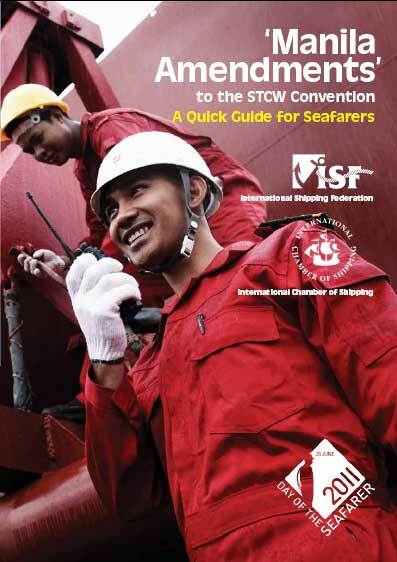 In particular there is a pamphlet that describes the impacts of last year’s IMO convention on the Standards of Training, Certification and Watchkeeping (STCW) held last year in Manila. The results are known as the Manila Amendments, or STCW2010. One of the major impacts, especially for sailors in North America, is the hours of work and rest; a provision already in full force, since January 2012. Yeah, really, like we need to tell employers that 14 hour work day are too long. Sorry, I diverged there… There are numerous other impacts on us seagoing types, the pamphlet highlight them, check it out.